Treatment with OKT3. A, Recommended protocol for OKT3 treatment. The development of host anti-OKT3 antibodies is a potential problem for the reuse of this drug in previously treated patients. About 33% to 100% of patients develop antimouse antibodies after the first exposure to OKT3, depending on concomitant immunosuppression. Anti-OKT3 titers of 1:10,000 or more usually correlate with lack of clinical response. 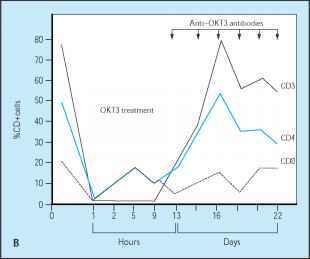 If anti-OKT3 antibodies are of low titer, retreatment with OKT3 is almost always successful. If retreatment is attempted with antimouse titers of 1:100 or more, then certain laboratory parameters, including the peripheral lymphocyte count, CD3 T cells, and trough free circulating OKT3 should be monitored. If the absolute CD3 T-lymphocyte count is greater than 10 per microliter or free circulating trough OKT3 level is not detected, it may be indicative of an inadequate dose of OKT3. The dose of OKT3 can be increased from 5 to 10 mg/d . B, Monitoring of peripheral blood T cells in a patient receiving OKT3 treatment. The absence of CD3+ cells from the circulation is the best parameter for monitoring the effectiveness of OKT3. Failure of the CD-positive percentage to fall or a fall followed by a rapid rise indicates the appearance of blocking antibodies. Approximately 50% to 60% of patients who receive OKT3 will produce human antimouse antibodies (HAMA), generally in low titers (< 1:100). Low antibody titers do not affect the response to retreatment (reversal rate almost 100%) if the rejection episode occurs within 90 days after transplantation. Conversely, titers above 1:100 or recurrent rejection beyond 90 days is associated with a reversal rate of less than 25%. The reversal rate is essentially zero when both high HAMA titers and late rejection are present. PO—orally; IV—intravenous.